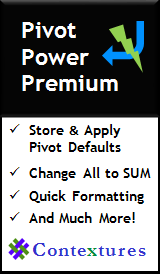 Sample macros to work with text in Excel. For example, a User Defined Function (UDF) with options for combining data from a range of cells. Contributed by Rick Rothstein. 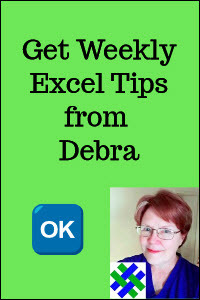 The Excel CONCATENATE function would be much improved if you could specify a range of cells to concatenate, and the delimiter that you'd like between the joined cell values. 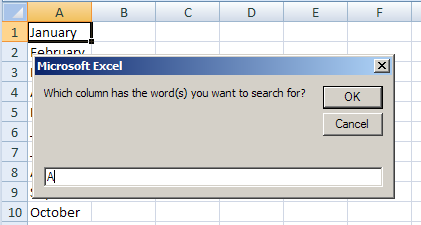 This ConCat UDF (user defined function), from Excel MVP Rick Rothstein, concatenates a range of cells, and provides the option to insert a common delimiter between the elements (think comma separated listing as one possible use). You can omit the delimiter, but leave the comma in as a placeholder. If IsMissing(Delimiter) Then Delimiter = ""
If you have never installed a UDF, the procedure is simple... press Alt+F11 to go into the VB editor, click Insert/Module from its menu bar and then Copy/Paste the above code into the code window that opened up. That's it. and the contents of those cells (and the word "HELLO") will be concantenated together, in the order shown, with a dash between them. The delimiter (first argument) is required, but if you want to concatenate cells, cell ranges or text together without a delimiter, you can specify the empty string ("") as the first argument or simply omit it (but still use the comma as a placeholder in order to delineate the argument position). If you install the ConCat UDF into a workbooks, then the function will travel with the file if you distribute it to others. If you find this ConCat UDF useful and want it available for use on any worksheets that only YOU will work on, just install it in your personal.xls file... just remember, though, if you install it to your personal.xls file and use if from there, then the function will NOT travel with any worksheets you distribute to others (meaning cells using ConCat will produce a #NAME! error on their computers) unless, of course, they install the function to their own personal.xls file as well. This code can be used whether there are empty cells in the range being searched or not. The only important part of the code is the With/End With block (the code before it is provides but one of many methods of specifying the column to be searched and the word to be searched for). 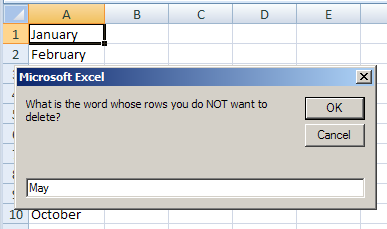 In a reverse of the previous code sample, Rick created this code to delete all the rows where the specified word DOES NOT appear. The code will search for instances where the whole cell is equal to the word(s) that you enter, not partial matches. Because the code uses the SpecialCells method, it is extremely fast -- much faster than looping through a range of cells. 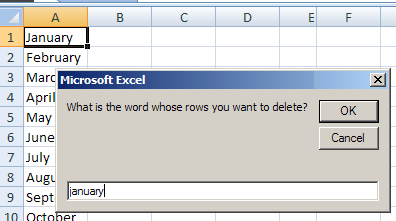 When you run the macro, you'll be prompted to enter a column (as shown in the previous macro), and the word whose rows you DO NOT want to delete.